Every once in a rare while, I'll find a fitness device that will hit the market that is truly outstanding. The MagicFit is it! It is a revolutionary device that offers vibration exercise fitness to help you tone and strengthen your muscles in just 10 minutes a day. Whole body vibration also promotes weight loss (sure to be a definite hit with the ladies!). We are happy to be offering you this versatile machine at the lowest cost possible (for this model). Just contact Claremont Colonic & Nutrient Resource Clinic to get the lowest pricing and also free shipping. (Left side model only). Although various types of vibration exercise machines are currently available, we specifically chose the MagicFit because we found that the resonant frequency of its powered plate is biocompatible with the human body, as evidenced by its ability to induce a 4-polarity state during use. 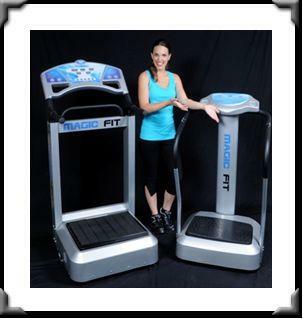 Magic Fit's Vibration Exercise program takes only 10 minutes a day - while you are simply standing on the vibration plate! It seems far too simple to do much, but I can tell you from personal experience that it feels very vigorous and you can experience the effects (i.e. better toned muscles) in even a single session. Of course, it's best to start out slower (2 to 3 minutes for the first few sessions), then work up to 10 minutes, once or twice daily. Whole-body vibration exercise fitness is backed by many years of scientific research. Over 750 scientific research studies on vibration exercise machines have been conducted in the USA, Canada and Europe. We also recommend PRL antioxidant products to help neutralize the cascade of free radicals that are typically released after an exercise session. Please feel free to contact your naturopath for a FREE trial or to order your own dynamic MagicFit today. Ten minute sessions are also available for only $10.00 to enhance your existing workout regimen or to begin an exercise program with Magic Fit. 10 Minutes a day takes the gym away!